Sod Installation - (How To Lay Sod) Hillcrest Sod Farms Mi. I think one of the most common questions we receive is how hard is it to lay a sod lawn? The answer is not really hard at all. In the grand scheme of home improvement, this project probably ranks on the lower end of skill level, and certainly on the lower end of the potential disaster. For one thing, sod prices, are really pretty inexpensive when tackling a small backyard or front yard project. 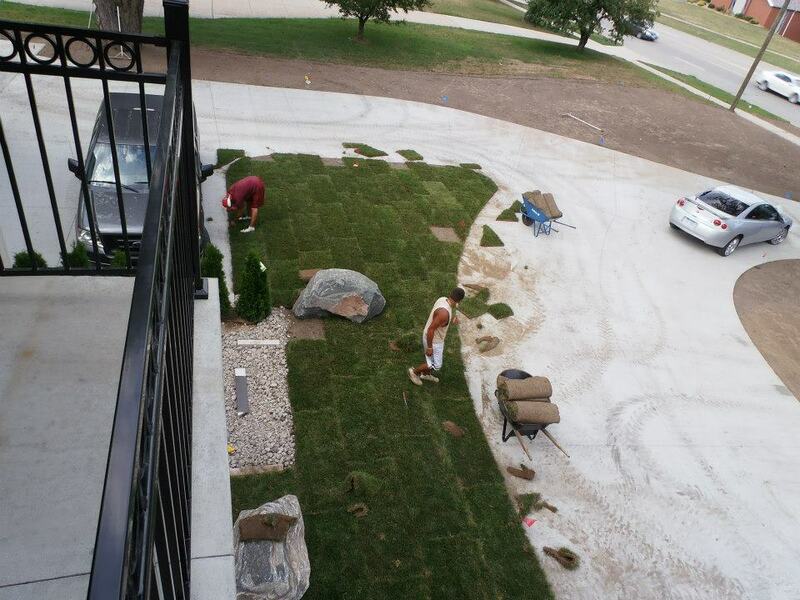 That in itself makes sod installation a perfect do it yourself project. Probably more than anything I want you to consider the environment in which you are about to install sod. Do you have at least four hours of sunlight? That is really an important question. Study the trees in your yard. Make sure that analysis is done when there is a full canopy of leaves on the trees. Finally, who is using this space? Do you have two golden retrievers who love to run? Hmmm. The point is sod installation is not hard, and not terribly expensive, but let’s not waste your hard earned money. So, on to the purpose of this post. Like any good home improvement, project preparation is important. When laying sod, making sure old grass, debris, and stones are free from the area is worth the time it takes to remove them. The site does not have to be perfect but remembers you are trying to get new sod to attach to your soil. Why would you have obstructions in the way of that? Also, the old grass you leave in place will take nutrients from the soil to decompose. Once you have removed the old grass think about how level the area should be. This is usually a good time to think about topsoil. Topsoil (I will write a whole separate entry on this) should be used to level the area, if necessary. If you think adding topsoil is going to bring a nutrient-rich sub-base for your new lawn, you are only guessing. There is no way to know what the nutrient breakdown or the soil make up is of the “topsoil” you are ordering. Remember topsoil from a screener at a supply yard is not the same topsoil defined in your ecology textbook.